This series of four lessons uses each Character in the nativity to tell about Jesus. This idea is one to be spread over several weeks leading up to Christmas. Each part could be expanded into a full lesson or simplified to be done each Sunday in addition to a planned lesson. If you structure your children’s programming with a main session followed by age-segmented small groups, then perhaps this could serve as the main session activity during the month of December. This article includes dates to be used for this year (Advent Dates 2018), but can be modified to apply to future years. If you’re in a hurry click the link below to download the four lessons in one print-friendly document. Don’t miss our free nativity coloring book. Lesson Objective: The children will learn the story of Jesus’ birth chronologically through the reading of Scripture. Pre K-K may need a separate coloring page for each part of the story. Time Needed: 15-20 minutes for each part. The first and fourth week will be longer than the second and third. Optional: Use our nativity scene coloring page & crayons. You could also get inspiration from these photographs. “What is a nativity?” Take input from the children. “Who do you usually see in a nativity scene?” Take input from the children. Set up the empty stable of your display. “This is a stable. Why would I be putting up a stable?” Take input from the children. “Today we are going to add our first person to the stable.” Hold up Mary for the children to see. “Who is this?” Mary. Choose a child to come up and place Mary in the stable. “What did God ask Mary to do?” Take input from the children. “Did Mary gladly agree? Did she have a good attitude?” Yes because she was a girl who loved God. Pass out coloring pages and crayons. Have the children color just the stable and Mary for today. When the children finish with their coloring, collect their pages so they can be used again in the coming weeks. Set up the stable and Mary as you review with the children what they learned from last week about these two parts of the nativity scene. Hold up Joseph. “Who is this?” Joseph. Choose a child to come up to place Joseph in the nativity scene beside Mary. “What did God ask Joseph to do?” Take Mary as his wife even though she was with child. “Did Joseph do what God told him to do?” Yes, he took Mary as his wife. Hold up baby Jesus. ‘Who is this?” Jesus! Choose a child to come up and place Jesus in the nativity scene. “Now let’s read Matthew 1:25 together.” Read aloud chorally with all children reading out loud with you. “Also turn to Luke 2:6-7.” Read aloud these verses to the children. “Who was born in the stable?” Jesus. Pass out the coloring pages and crayons. Have the children color just Joseph and baby Jesus. 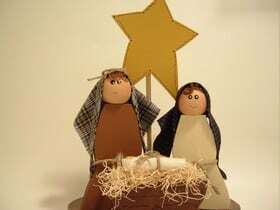 Set up the stable, Mary, Joseph and Jesus as you review with the children what they learned from the two previous weeks. Hold up the shepherd. “Who is this?” A shepherd. Choose a child to come up to place the shepherd in the nativity scene. “Why would there be a shepherd in the nativity scene?” Take input from the children. “Let’s see what the bible says in Luke 2:8-16.” Read aloud the passage. “So, why were there shepherds in the nativity scene?” Take input from the children. “Thinking about the passage we just read, who else do you think belongs in the nativity scene?” An angel. Choose a child to come up and place the angel in the nativity scene. Pass out the coloring pages and crayons. Have the children color the shepherd and the angel. When the children finish with their coloring, collect their pages so they can be used again next week. Set up the stable, Mary, Joseph, Jesus, the shepherd, and the angel as you review with the children what they learned from the three previous weeks. “As we finished up our nativity lesson last week you may have thought we were still missing some important people. Who was missing?” The wise men. “We usually include them in the nativity scene because they are an important part of the story of Jesus’ birth.” Choose three children to come up and place the three wise men in the nativity scene. “Turn in your bibles to Matthew 2:1-12.” Read aloud this passage. “What led the wise men to Jesus?” A star. “Why was King Herod upset about the wise men coming to see Jesus?” He did not like the idea of Jesus being the King of the Jews because it meant he (Herod) might no longer get to be king. “What gifts did the wise men bring to Jesus?” Gold, Frankincense, and Myrrh. Pass out the coloring pages and crayons. Have the children color the wise men and any remaining uncolored parts. Using the finished nativity scene, briefly retell the story of Jesus’ birth. The children can then find a partner and retell the story of Jesus’ birth to each other using their colored pictures. Need More Ideas? Browse our free advent coloring pages or explore all our free Christmas lesson plans. God Bless You! What a wonderful lesson plan for Advent. Thank you, Thank you! Tony Kummer (Editor) reviewed & updated this page on : December 26, 2018 at 11:36 am. All our content is peer reviewed by our readers, simply leave a comment on any post suggest an update.